What is an Antenna's "Antenna Factor"? 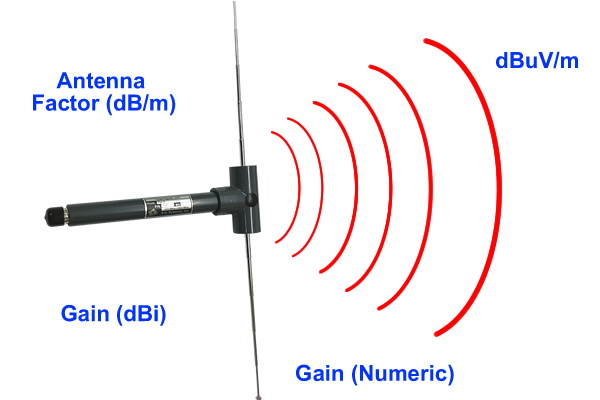 An antenna's antenna factor (AF) is a comparison between the field level presented to the antenna and the actual voltage produced by the antenna at it's connector. This can be seen in Figure 1. 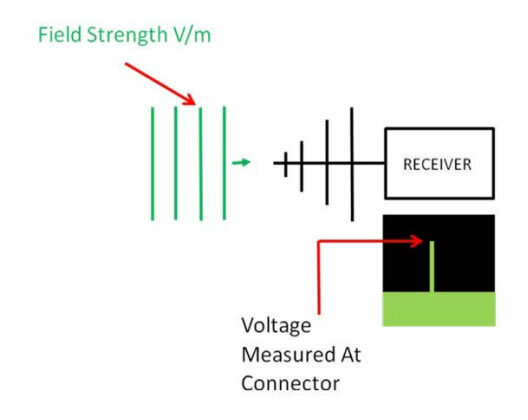 Note, the antenna factor varies with frequency, that is for the same presented field strength, but at a different frequency, the voltage produced at the connector is not constant. By way of further explanation, a not particularly accurate yet simple way to generate AF data for an antenna would be to illuminate it with a known field strength at a specific frequency, and use a receiver to measure the volts produced at the antenna connector. 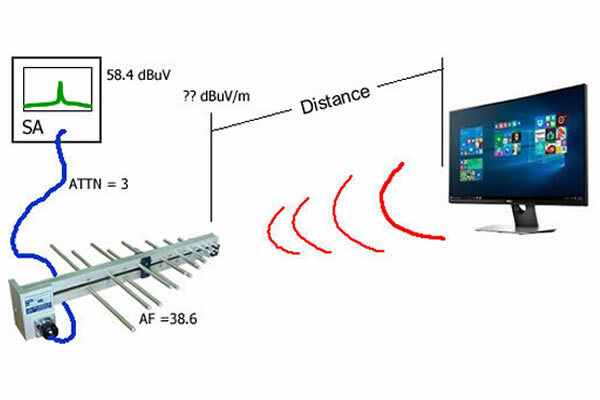 The reason it is not particularly accurate in this example is because we will use the RF train used in an immunity system to create a known field strength (say 10V/m) over the antennas frequency range (covered in equally spaced spot frequencies). This is shown in Figure 2. The field probe is then replaced by the antenna in question, the spot frequencies stepped through and the voltage at the antenna connector measured and recorded. Far more accurate AF data is supplied in plot form by the antenna supplier. A typical plot is shown in Figure 3. This data is input to the EMC emissions software so it can add the antenna factor to the entered cable loss etc. All the data entered into the software is in dB's. The field level emitted by the EUT can then be determined by simple algebraic addition of the voltage reading on the receiver and the entered data. That is the voltage reading in dBuV is added to the AF at that frequency and the cable loss at that frequency to obtain the actual field strength measured by the antenna. 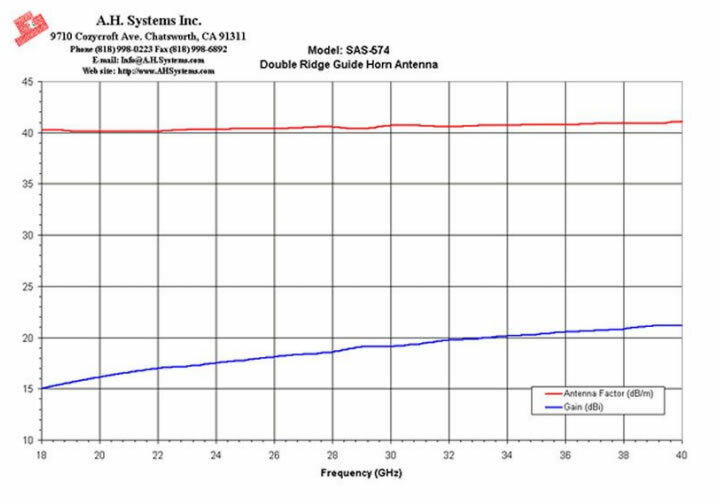 This article dives deeper into the explanation of the term "Antenna Factor": Antenna Factor Calculation and Deviations. Here is a useful Antenna Factor and Gain Calculator. 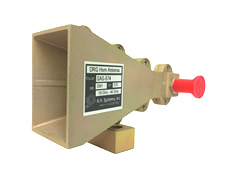 High gain, low VSWR, and rugged design make this dual ridge horn antenna excellent for both immunity and emissions testing. © 2019 A.H. Systems, inc.